Compared to many VPN providers Hide Me is a relative newcomer to the scene. The company has their home in Malaysia, so it is well out of any 5-eyes jurisdiction and any data retention laws. Within a short time, they have amassed an enormous number of Hide.Me VPN download and have a customer base which totals over 5 million. Can this Hide Me review be a simple matter of praising a top class VPN provider, or are there problems under the surface? Hide me does come with different plans so features will vary depending on which one you choose. Traffic which runs using this protocol looks like regular traffic, and it is hard for firewalls to detect and block. As a result, it has been heard to work in China and Egypt. Automatic Wi-Fi is another feature where the VPN is enabled once it detects an unsecured wireless network. 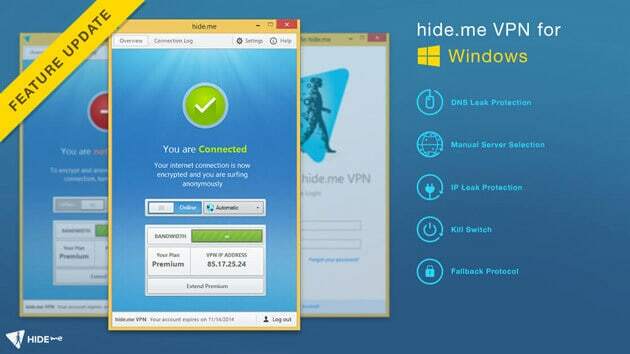 Hide.Me also comes kitted with a built-in Killswitch which keeps you protected even if the VPN connection fails momentarily. The free anonymous SOCKS proxy browser also allows users to access any site they wish from around the globe for Geo-restricted content. IP leak detection and DNS leak protection are well catered for. They also block IPv6 connections if you are provided one by your ISP. DNS leaks are plugged as by default a public DNS is created which gives access to the Hide.Me network. With this in place, all DNS requests are routed through their VPN and are invisible to anyone watching. If anyone is concerned about user data retention. Hide.Me holds no logs whatsoever, and they have had external audits to substantiate their claims. Such is their stance of no logging, they used this as a primary focus when they built their VPN service rather than deciding not to maintain a no logging policy once they were already running. 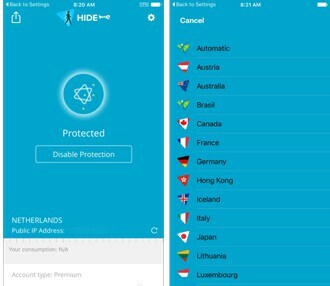 The Hide me website looks nice, although if you are looking for technical details, you’ll fall short. The company redeems themselves with some well-written set-up guides which cover most platforms users might encounter. They also offer plenty of multi-lingual support including some not so familiar languages. The Windows client is clean and fresh, although it needs the Windows.Net framework (4.6.1+) to be able to run. New users might become confused and stuck at this point. The interface is as simple as many other VPN providers, and it seems this is the way they are all going. Users have some options which they can choose should they wish to vary away from the default, but nothing is too extreme. Across all platforms, the interface has the same clean look apart from the Mac client which opens a guide window once you open the app. There are fallback options for protocols to use, but these aren’t the most secure, and it would be advised to change these before any first usage of the app. Hide.Me has 35 servers based in 28 countries which aren’t the largest by any means. However, they do cover some of the more obscure locations such as Morocco, Mexico, Brazil, and India. As there are two paid for plans, data usage is capped on the Plus Plan whereas on the Premium plan you have unlimited data. When conducting tests for this review an IP leak was detected, so asking is Hide Me VPN safe could be a hit and miss affair depending on set-up. It could be a one-off instance, and all the other times their secure encryption did offer full protection. During speed tests, we found even with local servers the speeds leave a lot to be desired and can leave many users hoping for more. 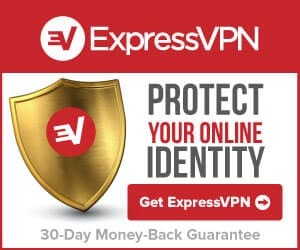 A Hide Me proxy can be set up which uses SOCKS 5, although this is unencrypted, it’s intended use is if your VPN connection is lost the proxy also loses its connection. Customer support is not the best, although it is by no means the worst. It could just do to be a little better. They provide 24/7 live chat, email, and ticketing systems for assistance which is better than many others. They do fall down on live chat technical support which is slow and handled by a ticketing system. 75 GB for a month might be okay for many, although for media streaming and torrenting this could pass by well before the month is over. Adding to this, you only receive one connection for the lowest paid for the package. Unless you sign up for a 1 year period, it works out expensive for a service which doesn’t compare with other market leaders. There is plenty to like about their service, and some of their faults might be down to them being new and not lacking expertise in every area. Hide.Me has potential to grow, and one of the first areas they need to remedy is their network size. As of yet, they don’t justify the price. There is better and cheaper, but they are one to keep an eye on for future reference.